California's iconic oak woodlands have endured many assaults over the years--they've been cut for fuel, cleared for vineyards and housing developments, and their seedlings face intense grazing pressure and competition from invasive grasses. A regional climate model prediction for future change in April-August precipitation reflects topographic variation (lower image; decreases are yellows to reds; increases are shades of blue). 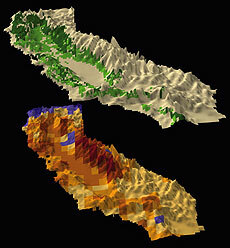 Consequently, habitat predicted as suitable for California endemic blue oak shrinks, and shifts northward and upward in elevation (upper image; dark green is future suitable habitat, light green is no longer suitable). But the future will bring a new threat--climate change--which could drastically reduce the areas in which oaks can grow. UCSC researchers have taken a close look at the implications of climate change for two familiar California oak species--blue oak and valley oak. Their findings will be published online this week in the Proceedings of the National Academy of Sciences and will appear in the November 8 issue of the journal. The researchers found that the areas of the state where the climate is suitable for these species to grow will shift northward and could shrink to nearly half their current size as a result of global warming. "Species such as oaks that we think of as occurring throughout California and that are such a recognizable part of the landscape are vulnerable to climate change. It's not just the rare and endangered species that will be affected," said Lara Kueppers, a postdoctoral researcher at UCSC and first author of the study. The researchers used sophisticated climate models to project what California's climate may be like in the final decade of the 21st century, assuming a "business-as-usual" scenario for ongoing emissions of greenhouse gases. Based on those projections, they predicted the potential ranges for blue oak and valley oak under the new climatic conditions, and compared that with their ranges under current conditions. Other researchers have used global climate models to study how the geographic areas where various species occur are likely to shift as a result of climate change. Even with powerful supercomputers, however, global climate models are limited in how much detail they can provide on a regional level. The UCSC researchers thought this would be a particular problem in California, with its complex geography and diverse ecosystems. So in addition to a global climate model, they also used a regional climate model for California that provides enough detail to distinguish major mountain ranges and valleys. As expected, the global and regional climate models gave different results, with the regional model indicating significantly smaller potential ranges in the future for the two oak species. The main reason for the difference is that the regional model shows stronger and more rapid warming at higher elevations, whereas the global model yields average results over large areas that blur the distinction between mountains and valleys within California. The regional model yields a climate scenario in which the future range for blue oak shrinks to 59 percent of its current range, and for valley oak the future range shrinks to 54 percent of its current range. For both species, their potential habitat shifts northward, meaning that these species are not present in much of the area where climatic conditions will be right for them in the future. "Suitable habitat is lost in the southern part of the state, and about a third of the new potential habitat is in areas where blue oaks do not currently grow. Most ecologists would not be comfortable assuming that the oaks will be able to get to those new areas," Kueppers said. Lisa Sloan, professor of Earth sciences and a coauthor of the paper, said the shifting of ranges for oaks and other species poses a challenge for conservation planning. "Our state parks and other protected areas are not set up to move with climate change," said Sloan, who directs UCSC's Climate Change and Impacts Laboratory where the climate model computations were carried out. The other coauthors on the PNAS paper are postdoctoral researcher Mark Snyder; Erika Zavaleta, assistant professor of environmental studies; and Brian Fulfrost, coordinator of UCSC's Geographical Information Systems Laboratory. Blue oak and valley oak do not occur naturally outside of California. Blue oak is found in the foothills of the Coast Ranges and the western Sierra Nevada, while valley oak grows on deeper soils along rivers and streams, particularly in the Central Valley. Both species are sensitive to temperature and rainfall. The changes in their potential ranges under the climate change scenario were attributable primarily to increasing temperature and decreasing rainfall during the growing season, Kueppers said. "If this scenario is what we can expect with climate change, then these oak woodlands are going to have to adapt pretty dramatically to new conditions or move significant distances in a relatively short period of time," Kueppers said. The study highlights the importance of studying climate change on a regional scale, because its effects will vary from one region to another, Sloan added. "More intense hurricanes are the issue on the Gulf Coast, while melting sea ice is important in the Arctic," she said. "In California, the strongest effects of climate change are in the mountains, creating concern for our water supply and for the natural ecosystems that attract so many visitors."